I sort of foreshadowed the DL introduction with my earlier article on what Nikon needed to do to fix the Nikon 1 line. Now that the DLs have been announced—earlier than I expected, though they won’t be available to customers for quite a while—I can be clearer. If the Nikon 1 is to survive, it has to have a well-defined place between the DL models and the bottom of the DX line. Plus there’s a chance the bottom of the DX line goes mirrorless, which muddies the waters, too. Well, the buffer part ought to be obvious: use a stacked sensor, add DRAM, and use faster card write technologies. That’s absolutely achievable today. No reason why a Nikon 1 has to stop at one second of fast shooting. But “better sensor”? Yes, I think that, too, is possible. The question is whether it’s worth going up in megapixels or not. I think not, as diffraction is definitely in play with 20mp 1” sensors already. But I’ll bet that a 12mp or 16mp sensor using absolutely cutting edge technologies could drive the per pixel performance upwards enough to be compelling to some. Moreover, the sensor issue is really only there in terms of the DL; it’s a given that no matter what Nikon does in 1” it would be not what they can (and do) do in DX. Moreover, sensor is exactly where each new model in the Nikon 1 line has improved. Clearly, Nikon was already coupling sensor change with model change in the Nikon 1 lineup. They just have to do it again, but they also need something that’s clearly marketable as “better” than where the DL now sits. "Better focus?” Yes, I think that possible, too, but it will take a combination of more computational power and additional controls (see next). Feature Differential — Since I just mentioned focus, let me point out that one of the flaws with the Nikon 1 focus system isn’t the camera’s autofocus performance, it’s in the user control of that. We don’t have an AF-On button (though it can be programmed into a marginal button). We don’t have truly eyes-at-finder ways of switching focus settings. We don’t have a perfect at-the-thumb method of moving focus point (e.g. the thumb controller on the D5 and D500). The key point in feature differential is that you want to design the Nikon 1 models so that the user has direct and complete control, and preferably in the form used on the DSLRs. That means Command dials, dedicated buttons for things like ISO, plus those focus controls I just mentioned, at a minimum. The DL’s have some user control, but it is more the compact camera style: overloading of the Direction Pad, minimal buttons, plus use of the touchscreen LCD as a shortcut. But those things are all “poor” for the eyes-at-the-viewfinder user. They work well for casual, slow, methodical shooting, not so much for in-the-moment shooting. Since I just mentioned viewfinder, a built-in EVF has to be part of the feature list, period. And I’d argue that this has to be better than the EVFs Nikon has been using. Faster refresh, higher dot count, better tracking while continuous shooting, etc. Usage Differential — The Nikon 1 has to be usable and useful in more scenarios than the DL, simple as that. Weather protection is an absolute must, therefore. But part of the usage differential isn’t the camera, it’s the lenses. And that’s where what Nikon did with the DLs starts to be the toughest to solve. We simply don’t have a set of 18, 24, 28, 35, 50, and 85mm (equivalent) primes for the Nikon 1 that are perfectly appropriate. Maybe you can argue that the 28, 50 and 85mm (equivalent) ones are, but I’d say only the 50mm (equivalent) is (e.g. the 18.5mm f/1.8). It’s the right size, right spec, right performance. The 28mm (equivalent)—that’s the 10mm f/2.8—might be the right size, but not the right spec or performance. The way the Nikon 1 system currently covers that basic DL set of focal lengths is with terrible kit lenses. Terrible in spec (28-80mm isn’t right, and f/5.6 is too slow for the small sensor), terrible in performance, and really terrible in attributes (no lens hood possibility, are you kidding me? What other US$500+ camera can you say that for?). So we also need new zooms. Moreover, since we’re talking usage differential, autofocus and powered zoom isn’t what we want. We want clear and usable manual focus ability and manual zoom as well as the automatic and powered stuff. And with those, we want things like focus peaking and direct magnification for confirmation. The problem with what I’ve just laid out is twofold. First, that’s a very small design space to fit into. The DLs are awfully well specified, and the low end DX DSLRs are as well. There’s not a lot of space here for another product line, and the space is all relatively high-end. Which brings up the second problem: price. The lowest DX DSLR already is lower than the DL in price. Now with a Nikon 1 refresh we’d be pushing performance, features, and usage items that increase that price significantly. We’d get up into the higher DX DSLR prices, exactly where the Nikon 1 failed before. But that’s all Nikon really has to work with, frankly. A small space that is going to produce relatively high priced Nikon 1’s that are essentially mini performance DSLRs with a two stop sensor penalty. I personally wouldn’t mind having such a product, though I’m not sure I’d buy it. And there’s the rub. Nikon is squeezing themselves this time around, as opposed to having the market squeeze them. I’d vote for Nikon to squeeze themselves some more, actually. What do I mean by that? Well, take the DX DSLRs down in physical size—they’re bigger than many old film era SLRs—without otherwise compromising them, and give DX a full, appropriate lens set (buzz buzz). Aside: some people are reading too much into the CP+ booth and the lack of any Nikon 1 presence there. Nikon has turned into a company that mostly markets “the new” and lets the old just work its way through the system via pricing adjustments. 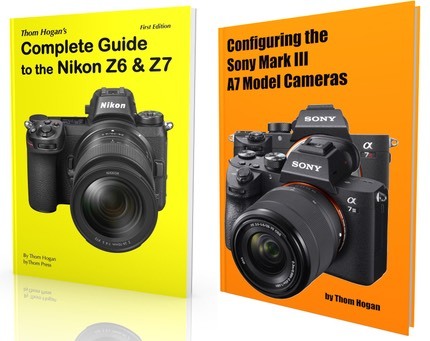 This is in contrast to maybe five years ago when Nikon had one of the most efficient “pull people into dealers” campaigns going, and which emphasized the entire product line simultaneously. I suspect that some of Nikon’s transition towards marketing the new has to do with getting as many sales as possible early on when the margins are the highest, some has to do with trying to keep emphasis on Nikon keeping up with the Joneses, some with the fact that as they’ve dropped staff they just don’t have the resources to market everything efficiently simultaneously. What Nikon does next with the Nikon 1 speaks volumes, I think. The options are (1) retire it; (2) let it decline to retirement; and (3) re-invigorate it. I’ve just outlined what I think it would take to re-invigorate it. Anything less is almost certainly #2 and will be recognized by users as such. #1 would require an immediate fire sale of standing inventory. I wouldn’t want to be head of Nikon marketing right now. I’m sure corporate is trying to say “at least pretend it’s #3,” but the DL and Nikon’s tepid handling of the Nikon 1 right now strongly suggests it is instead #2, enough so that I’m already hearing from Nikon 1 owners who are looking to move on to something else, and that might not be a Nikon. Oops. This is a product line marketing crisis in the making. It requires quick and decisive action to keep customers assuming the scenario is defacto #1 by thus simply deciding to abandon and/or ignore the Nikon 1. Unfortunately, Nikon will take their usual course of inaction and thus leave themselves to the whim of the speculating customer, who’s already not exactly happy with Nikon. I’ll say it once more: if Nikon wants to save the Nikon 1, they need to do it quickly. Worse still, we have this huge gap between when the DL was announced (February) and when it will ship (late June). So if Nikon is still making DL noise during this time and nothing Nikon 1 shows up, the deed is done. Nikon will have not just have shot themselves in the foot, they’ll have amputated the foot. Last week I asked: is it Nikon 1 and done? At the moment it sure looks like it.